For the past five hundred years, we've been looking out at the universe and assuming that we, with our little planet and our little solar system, were nothing special. And then we sent out a probe to measure the cosmic microwave background. It gave us some data that makes it seem like we might be a bigger deal than we thought. In the beginning was a bang. That bang gave off a lot of light. Over the years, and over the length of the light's travel through an expanding universe, that light got stretched out. It started out as high frequency radiation, like gamma waves. Eventually it stretched into visible light. And after over thirteen billion years of travel, it got pulled into microwaves. These microwaves form, from Earth's perspective, the background to the entire universe. And as far as we could see, they were fairly consistent all the way through. This fit what we call the Copernical Principle. It reflects the mindset that has taken over astronomy since Copernicus knocked the Earth out of the center of the solar system. The Earth we live on, and our corner of the universe, is not positioned in any special way. It's not the center of the universe. It's not in and special part of the universe. It's just another mediocre speck. This isn't a scientifically proven fact. It's just a good way to dispel human ego, and it hasn't steered us wrong so far. And then WMAP went up. Wilkinson Microwave Anisotropy Probe took a good look at the anisotropy cosmic microwave background. Although the CMB signal is pretty much the same everywhere, it has lumps of high strength and low strength. If it were perfectly even in all directions, it would be called isotropic. The fact that sometimes parts of the signal seem to vary in certain directions makes it anisotropic. The variations aren't a worry to scientists - a little variation in the entire universe wouldn't be surprising. But every little difference is worth studying. It is our only chance to look at the big bang. One of those odd clumpings of signal strength has given people pause. There seems to be a strong signal forming a circular band around the universe. And that circle seems to be in line with the ecliptic of our solar system. 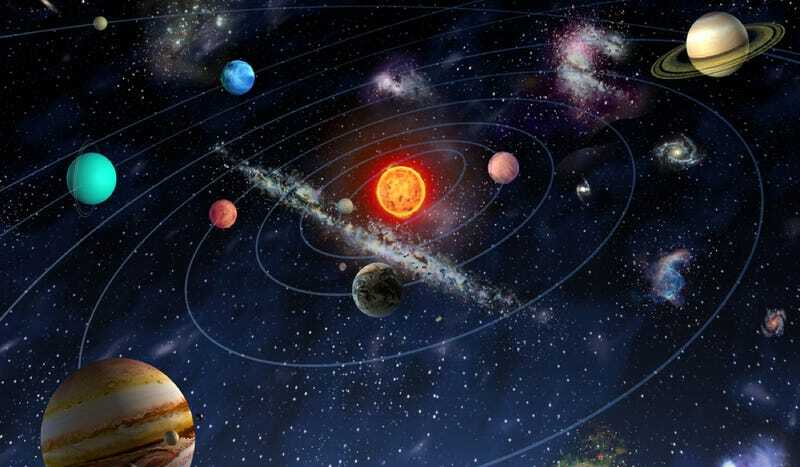 The rings that the planets describe around the sun are miniature versions of that strong signal. Looking out at the sky, we see galaxies and exoplanets orbiting their stars along planes in all directions. Why should this signal be so similar to the plane of our solar system? And how does that jibe with the principle that has been helping humble astronomers for half a millennium? In the end, we don't know. It's possible that, if this is a major force in the universe, being aligned would be more common than being unaligned, and so the Copernical Principle is in no way compromised. Some think that it was just some wrong turn in interpreting the data. It's also possible that WMAP took some other energy source - a source specific to this solar system - to be the cosmic microwave background. Whatever it is, it remains a mystery. Are we special? I'm guessing no, but it would be a kick to be proved wrong. Via UCLA, Hindawi, and NASA.